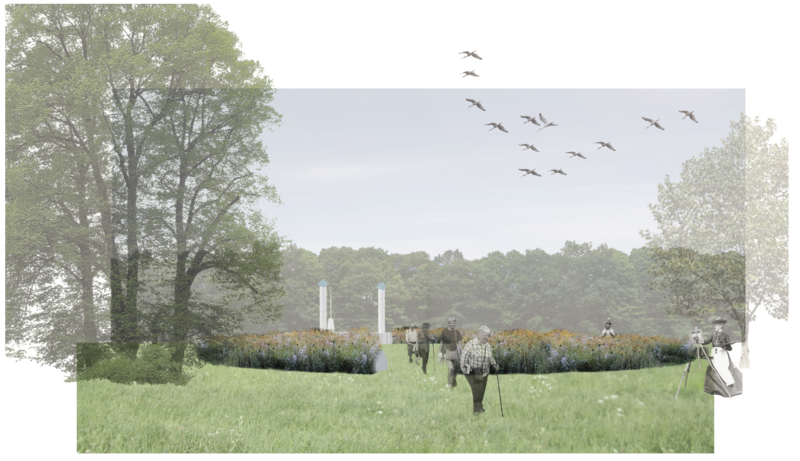 Concept design for an open air theatre; Ragdale is one of the largest interdisciplinary artist’ community in Chicago that offers a residency in their beautiful 5-acre historic campus beside a beautiful 50-acre prairie. 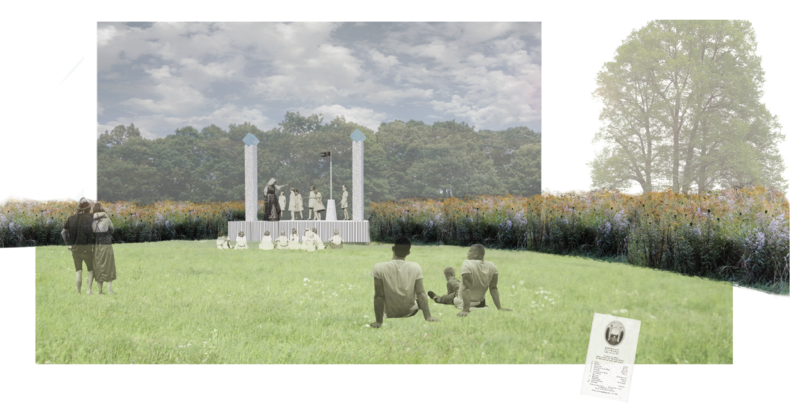 Each year they organize an international design competition regarding an open-air theatre for the Ragdale Estate. ‘Prairie Theatre’ consists of a circle, a square and a triangle. The main shape, the circle is formed by a ridge with prairie plants growing on it. 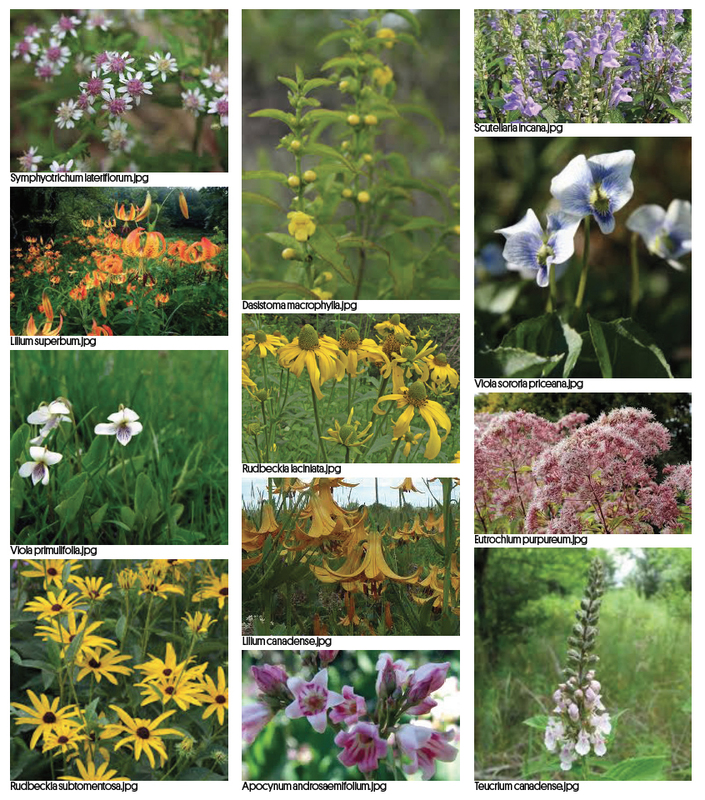 The prairie planting changes throughout the whole season. Low and mostly green in spring, high and rich in color, shape texture and smell in high summer and golden, dried out near the end of the season. Even without a performance, the circle is an ever-changing theater of nature, with always something on show. Contrasting with this natural circle is the highly designed stage set, a square space of 6 x 6 meters. On the stage three vertical elements form a triangle, referring to the original columns and vase. 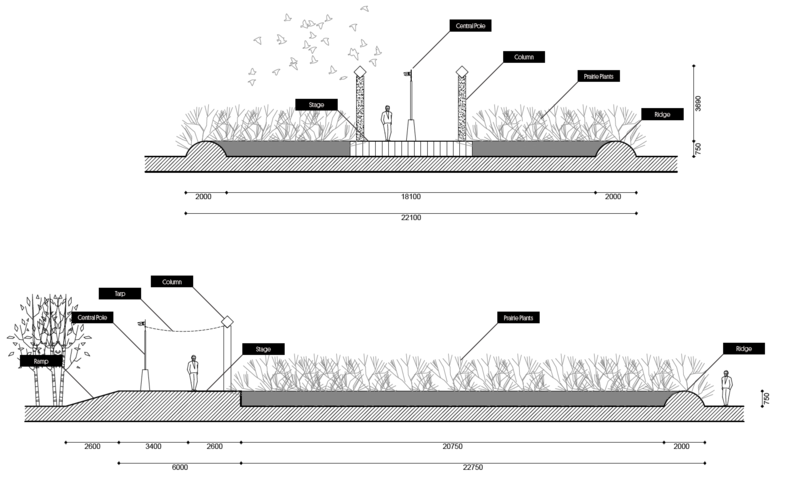 Stage and columns have bold graphic patterns, enhancing the contrast between natural planting and graphical stage set. The columns are contemporary versions of the original ones. Instead, of a fruit basket, a Perspex abstract blue cube, playing with the spell of sunlight. Center stage, the vase is translated into a central pole with the Ragdale flag. In between the columns the central pole a tarp can be hung, printed with a pattern similar to that of the columns, covering the performer from rain or sun. Visitors can engage to the performance by using small lanterns, which they can carry with them along the route to the theater and simply stick them in the ground next to their chosen sitting spot. Same as the prairie plants, the lanterns will delicate glow and swaying slightly in the wind. The lanterns offer multiple opportunities for performances.